Fortnite is still keeping its lead in the tough competition against Apex Legends and to ensure that the race stays this way; Epic Games has announced the biggest update of the season yet. Season 8 of Fortnite is about to release any day now and fans cannot be more excited. Speculations are circling about the launch date of event but there is no confirm news yet. If you are also trying to figure out the exact date, keep reading this article. By the end of it you may get an idea of the actual release date. The new update will be probably live sometime around today. A rough estimation is that servers will go down under maintenance at 4 AM ET. Following tweet was shared not long ago on the official account of Fortnite. Now it is not confirmed that how long will the servers take to update as these maintenance updates can take up to several hours. As you can see, there is no official time for the servers’ return. 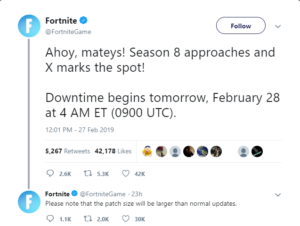 If we take their previous tweet in to account saying “This patch will be larger in size as compared to normal updates”, we can expect a much longer wait time. Don’t worry though, they know how anxiously players have been waiting for Season 8. They won’t keep you waiting for too long. You can expect Season 8 to start approximately around 8 or 9 AM EST on February 28. We will keep you up to date about the patch. As there is not much time remaining, and you’ll be facing the server down for maintenance message soon. Better fill your hunger for the game before the “long” break. But it will be worth the wait as the new update will contain a lot of challenges and improved features. 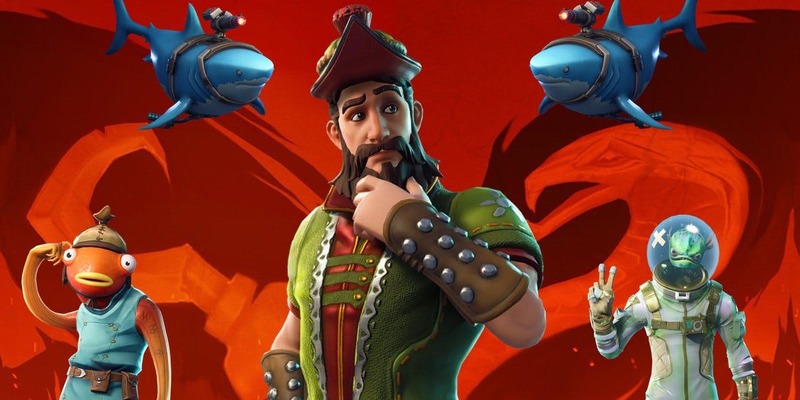 We would suggest that you read our article about Fortnite Season 8 patch note in the meantime. It contains all the information that you are going to need before the official launch. You can also checkout some Season 8 teasers on YouTube to spice things up. 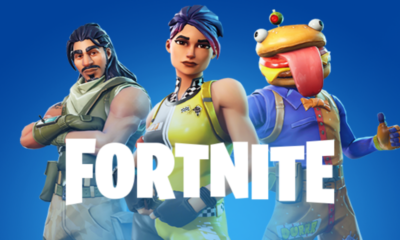 How excited are you to try the latest Fortnite update and what are your expectation from it? Don’t forget to tell us in the comments section below.